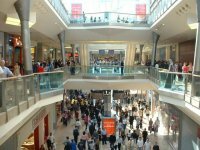 The redevelopment of Birmingham’s Bullring shopping centre was undertaken at a cost of over £500 million and has created a unique array of shops, boutiques and restaurants all under cover and taking up the space of over 26 football pitches. Selfridges in Birmingham is their flagship store and one of only four nationwide and has been acclaimed for its modern and innovative design and architecture. Within the stunning building are 4 levels each with galleries overlooking the floor below. Caversham is just 20 minutes' train ride or drive from the centre of the Bullring and Selfridges.